Coffee Addict? Here are a few tips for brewing coffee. If you are a coffee drinker who needs their mug in the morning; nothing beats these tips for a quick, stress free experience. Most people brew the same amount of coffee each morning, or may have two schedules, one for week days and one for weekends. These tips accommodate any brewing schedule. Open your coffee can or bag. Get a two cup (or larger) measuring cup. Using your measuring scoop, count out your standard morning amount of coffee. For me, this is seven level scoops, and the eighth scoop is heaping. Put the desired amount of coffee in to your large measuring cup. Make note of how much coffee is in the cup. Let’s say it’s a little over a 1/2 cup, for our example. Now, take (or buy) an inexpensive measuring cup that is 3/4 cup ( slightly larger than 1/2 cup) and transfer the coffee to this cup. Take a sharpie marker and draw a line on the outside of the measuring cup at the “fill line”. Now, when you wake up in the morning, use this marked measuring cup as your coffee scoop. Fill it to your “fill line”, pour in to filter, add water, and brew. 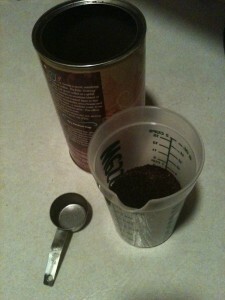 Measure out the beans into a measuring cup, mark your “fill line”, and use this marked cup as your scoop. Additionally, you can do the same thing with your water by putting the pre-measured amount in a carafe and storing it in your refrigerator until you’re ready to brew.